The Chauvet H1301 is a water-based fogger capable of a great output of 20,000 cfm, enough to fill a venue within minutes. It has a 3.3-liter (0.9 gallon) tank and takes only 5 minutes to heat up. The Chauvet H1301 features a low-fluid indicator and automatic shutdown to protect your pump from overheating. A wired timer remote (FCT) is also included to automatically trigger the fog output. This fog hangs low and sticks around. 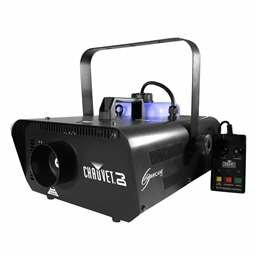 Prepare for the raddest dance or Halloween party or theater production ever, thanks to Chauvet Hurricane Pro Smoke Fog Machine with Wired Remote.